Dearborn, Michigan — a lively suburb of Detroit — offers beautiful sights, delicious cuisine and plenty of interesting things to do. About 20 minutes west of Detroit, Dearborn is a fantastic and romantic place to visit. Sightseeing — There are so many places to explore and experience in Dearborn, Michigan. This suburb has many opportunities for couples to be spontaneous and romantic. Exciting activities — You and your significant other can participate in fun activities with the community and get a feel for how Dearborn functions as a friendly and family-oriented place. Historic sites — Whether you’re interested in the Civil War or places unique to Detroit, you’ll find plenty of history to learn about in Dearborn. Arts and culture — Dearborn is close to theaters that focus on bringing the community together. Local restaurants — What’s more romantic than a local restaurant with its voice and vibe that separates it from the rest? Our restaurant, TRIA, has a unique menu and casual, charming atmosphere that make it the ideal place for a romantic date. With the city so close, there’s never a shortage of events or destinations to explore. But Dearborn has its special charm, too. When you visit Dearborn, make sure to take advantage of all the lovely and unique things to do and see. Planning a first date can be stressful. 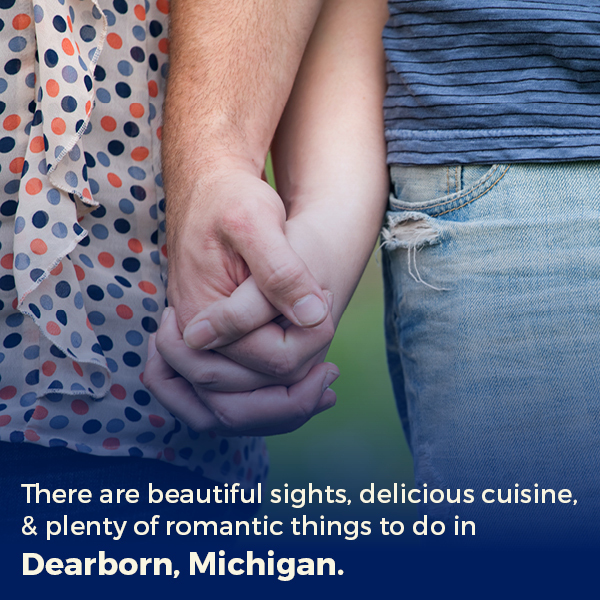 Luckily, Dearborn has so much to do that you’ll find something to make the date fun and memorable. There’s something for everyone. All you have to decide is what you want to do, whether it’s doing an activity, strolling around, learning about the area or trying something new. No matter what you pick, there’s a good chance you’ll be able to find it in Dearborn. Cranbrook House & Gardens — This is a great spot for summer and early fall. 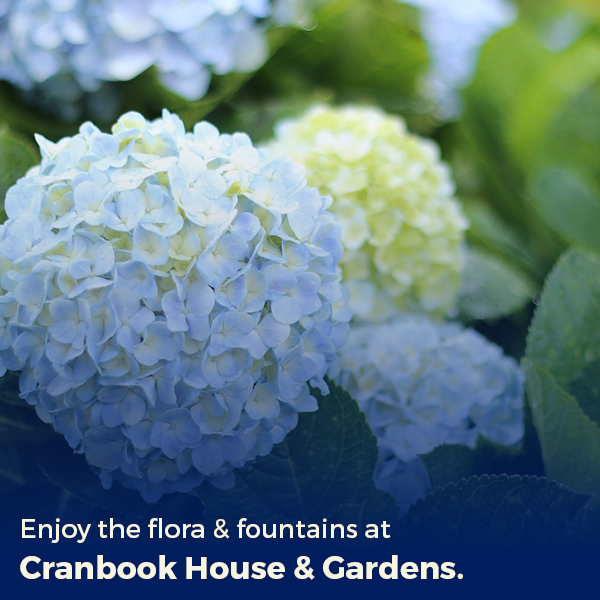 The Cranbrook House & Gardens is a historic landmark full of beautiful gardens and fountains. You can tour the house and walk around the gardens on self-guided tours. You’ll learn about the history of the house and the family who lived there. The property has 40 acres of gardens that will keep you entertained with plenty of time to talk. Anna Scripps Whitcomb Conservatory — Explore the vast collection of the Anna Scripps Whitcomb Conservatory, which is the oldest continually running conservatory in the U.S. There are five different sections to see. This indoor activity is open year-round and heated, making it a must-do for when you need a break from the cold winter days. Get away from snow and ice and see lush flowers and succulents in the warmth. Henry Ford Museum of American Innovation — The Ford Motor Company started in Dearborn, Michigan. The Henry Ford Museum of American Innovation celebrates the past’s fantastic inventions and leaders to inspire an even better future. See exhibits like the bus where Rosa Parks made history when she refused to move from her seat, or learn about the Wright brothers and their journey to achieve flight. The museum has two unique exhibits that will interest you and your date. One is the Dymaxion House, built by famed engineer Buckminster Fuller in 1946 in Wichita, Kansas. His intention was for housing to be affordable, dependable and self-sufficient. He used aluminum to construct the house, which can withstand a tornado. The 1,100 square feet covers two bedrooms and includes forward-thinking features such as a maximally efficient water system that reduces water use and naturally occurring heating and cooling. The house was cost-effective, required little maintenance and would cost the same amount as a higher-end car. But the trend never caught on with the American people. Fuller donated the only prototype to the museum. Another curious exhibit at the museum is Edison’s Last Breath, a glass tube that purportedly contains inventor Thomas Edison’s final breath. Henry Ford was a friend and mentee of Thomas Edison. The legend states that as Edison’s health declined, Ford asked Edison’s son, Charles, to capture the inventor’s final breath in a test tube. The legend isn’t entirely true. Charles Edison reported there were eight test tubes near Thomas Edison when he died. Charles knew his father loved chemistry, so it seemed fitting to keep those tubes close at hand. Charles had someone seal them with paraffin, and he gave one to Ford — who was a follower of the trend of spiritualism and reanimation. Whether the tube has the last breath or not, it’s a physical reminder of Ford’s admiration for inventors. Edison helped inspire Ford, and the Ford Museum aims to encourage people to ask questions and make discoveries. Automotive Hall of Fame — Built in 1997 in Dearborn, this hall commemorates the people who worked hard to progress the automotive industry. These innovations have far-reaching consequences that helped revolutionize our lives, too. You and your date can see how the automotive industry started, how it spread around the world and how much creative and daring work goes into automobiles. The Dequindre Cut Greenway — Walk or bike the recreational path that connects East Riverfront, Eastern Market and the neighborhoods in between. It’s a two-mile long gallery of urban artwork and graffiti. This path used to be a Grand Trunk Railroad line, and there are spots where you can still see what the railway looked like when it was in its prime. Hazel Park Raceway — Want a night out where you and your date can grab a beer and watch horses race? Visit the Hazel Park Raceway, which is north of Detroit. Racing season is May through September. They also have free general admission and parking. You both could place some bets and see if you have an eye for picking winners. There’s always an extra bit of fun at the racetrack. For example, in September, the raceway celebrates Oktoberfest with German food and beer. Detroit City Football Club — Show some local spirit and support Detroit’s soccer team. The games are fun, and it’s great to be part of the community. Before each game, fans meet up at Fowling Warehouse, a local bar. Then, the entire group marches to the match, chanting and cheering for their team. Place 10 bowling pins on top of 8′ x 42″ plywood boards set 48′ apart. Two teams take turns throwing the football at the bowling pins. Men have to throw from behind the plywood. Women are allowed to go up to the side of the plywood, or choose to throw from behind like the men. Staying behind the plywood will also open up more opportunities for friendly banter about who has the better throwing arm. The first team to knock all the pins off the board wins. Locals love this game, and Fowling’s Warehouse is the only official place you can try it. This game isn’t so much about power as it is precision, so you don’t have to be a quarterback or know how to throw a spiral to have fun. After the game is over, you and the other team meet and shake hands. It’s customary to say “Good fowl,” and maintain the game’s spirited and friendly focus. To add some extra fun, Fowling Warehouse allows you to drink as you play. Windsor — Feeling like you want to make a big first impression? Grab your passports and spend your first date in a foreign country. Windsor, Ontario is a quick ride over the Detroit Windsor Tunnel. You can walk around the city and see what it has to offer. Fort Wayne — Is your date a history buff? You can visit Historic Fort Wayne. This is Detroit’s third fort. The site has a history that involves Native Americans, Europeans and Americans. Foreigners who excavated the Native American burial mounds at the site date them to around 1000 CE. The area had a part in early trade routes, the War of 1812 and the Civil War. There are also reenactments where you can see what life was like in the 1800s. Focusing on education and an immersive atmosphere, you and your date will enjoy experiencing this jump back in time. Eastern Market — Eastern Market is a year-round market that celebrates local businesses. You can do your shopping for the week, have some delicious food and enjoy the hustle and bustle of a city market. The market is open every Saturday from 6 a.m. to 4 p.m.
Fall Flavor Weekends — Your first date could thrive with some seasonal inspiration. 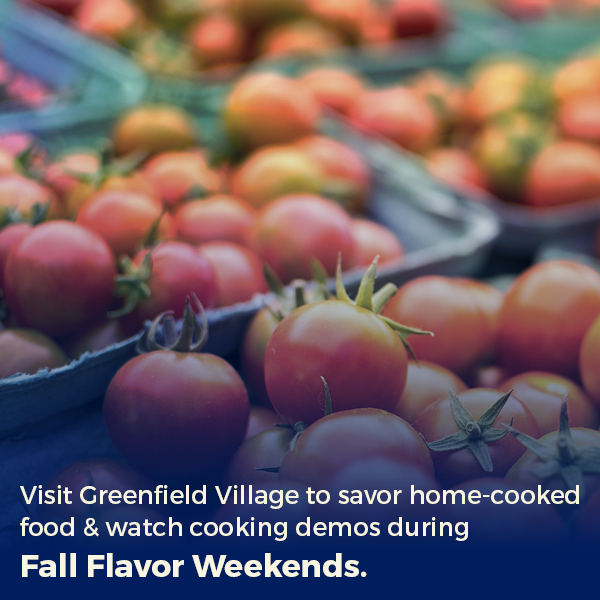 Greenfield Village holds Fall Flavor Weekends to welcome the start of fall. The beginning of chilly weather means it’s time for warm, home-cooked food. There’s plenty of delicious local farm-to-table food, and presenters have cooking demonstrations in historic homes, so you can learn about American culinary history. Outside, they offer old harvesting techniques. John King Books — This fantastic bookshop has an amazing collection. It’s Michigan’s largest bookstore, with stacks of used and rare books. Wander around the many shelves and see what interests you. The bookshop has four floors, but don’t worry, because you’ll get a map when you walk in. Glass Academy — Ever wanted to try your hand at glassblowing? The Glass Academy in Dearborn has workshops and events where you can learn how the technique works and make something beautiful. Your date would be innovative and unique as you both flex your creative muscles. Slow Roll — Looking for a healthy date activity where you can exercise? Participate in the Slow Roll. This 4,000-person-strong weekly bike ride leaves from Midtown, and everyone rides about 10 miles through the city. There’s no reason to worry about dealing with hills, because the terrain is completely flat. You might not have the first-date jitters, but still want something exciting and new. Fortunately, there’s no shortage of romantic date ideas in Dearborn. This suburb has so much history and local culture you and your significant other can enjoy for many memorable date nights in the future. Ford Drive-In — Go on a date at the largest drive-in theater in the world. Established in the ‘50s, the Ford Drive-In has five screens and audio that comes through your stereo. The drive-in inspires a romantic atmosphere, and you can talk during the movie if you want without worrying about disturbing other people. Just remember to bring your own snacks. Redford Theatre — The Redford Theatre is a fantastic option for a date where you can watch classic movies in style. It originally opened in 1928 and has unique characteristics, like having three stories and an organ console. Volunteers and donations preserve this piece of history so all can enjoy the experience of the movie palace. Rattlesnake Club — What’s more fun than hanging out with your significant other and trying Michigan craft beers and acclaimed wines? The Rattlesnake Club offers this experience and has delicious meals to go with it. In the summer, their Garden Terrace is open to whoever wants to look over the river and have their meal with a fantastic view. Cliff Bell’s — This venue combines all aspects of culture. Drop in for live jazz, cocktails and delectable meals and enjoy the experience with your significant other. Ice Skating — Why avoid the cold when you can embrace all the great activities that come with it? Spend a night ice skating outside. You can skate in downtown Detroit at Campus Martius. They have a tree-lighting ceremony in mid-November, and the rink is open until the beginning of March. 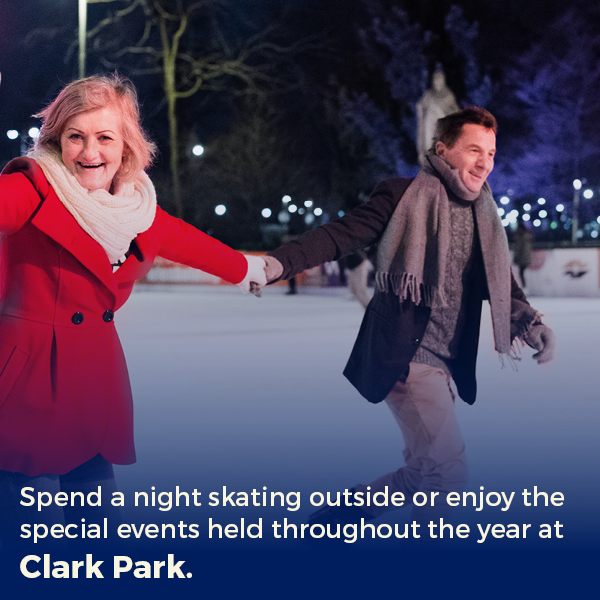 Another place you can skate is Clark Park, a town square where Detroiters can gather and celebrate the community. In addition to skating, the park has festivals and special events throughout the year. The Detroit Institute of the Arts — The DIA offers free entertainment on Friday nights, called Friday Night Live!. This series includes concerts, workshops and tours. Other events include Sunday Music Bar and the Detroit Institute of Awesome, or catch a movie at the Detroit Film Theatre. Where Can We Have a Romantic Meal in Dearborn? A romantic meal is often an excellent way to have a fun date night. A lovely atmosphere, tasty menu and impressive bar selection will help you and your date have a fantastic time. When you’re looking for romantic restaurants in Dearborn, make a reservation at TRIA, an American brasserie in the Henry Hotel. We provide a contemporary American cuisine and serve breakfast, lunch and dinner with vegan, vegetarian and gluten-free options. Our food features seasonal Michigan ingredients to incorporate our location with our food. We also have an extensive selection of 35 wines you can choose from. Make your next date night a romantic one. If you’re planning a Dearborn romantic getaway, get in touch with us today.